Thiru Adhanur near Kumbakonam is one of the 108 Divya Desams.dedicated to Lord Vishnu. Andalakkun ayyan temple here is one of the Vaishnava navagraha parihara sthalams around Kumbakonam. It is a Guru parihara sthalam. The main deity in this temple is Andalakkumayyan. He is present here facing East in Kidantha Kolam and Bujanga sayanam. He has been worshipped here by Brighu Maharishi, Kamadhenu, thirumangai Azhwar and Agni. His consort here is Ranganayaki Thayar also known as Kamalasini.The utsavar is Ranganathar. Adi pooram, Brahmotsavam in Vaikasi and Pavitrotsavam in Avani are some of the important festivals in this temple. 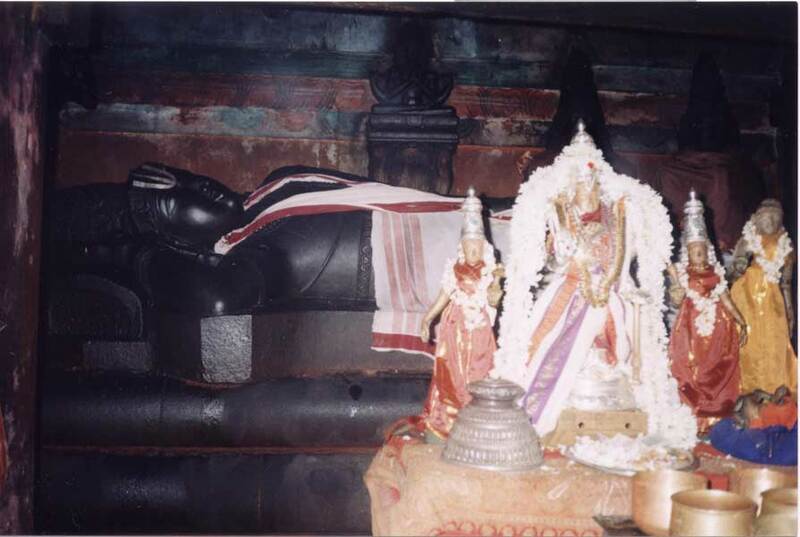 Perumal blesses the devotees in a reclining posture. The Vimana above the sanctum is called Pranava Vimanam. The Rajagopuram is of three tier structure. The temple is in between Cauvery and Kollidam rivers. As Kamadenu the divine cow (Aa in Tamil means cow) performed penance here, the place is named Aa, Than-Its – place – Aa Than Oor – Athanur. There is a sculpture of Lord Vishnu on the sanctum Vimana among three Boodha Ganas. People say the idol is growing in years. Thiumangai Azhwar had undertaken the task of constructing the wall of the Srirangam temple and was on a trip to mobilize funds. At Thriu Adhanur, he met a person who claimed to be a messenger of the Lord. This stranger had a measuring bowl (marakkal) in his hand. He said that by reciting the name of the Lord and holding the empty measuring bowl he could get whatever he desired. Thirumangai Azhwar requested for payment of the wages for the labourers at Thiru Adhanur. The stranger laid a condition that he would measure sand with the empty measuring bowl and pay as wages. The sand would turn into gold for the sincere workers and for the others it would remain as sand. When the sand was measured and given to the labourers many of them found that it did not turn into gold and remained as sand. Thirumangai Azhwar was intrigued and started going after the stranger who had by now left the place. He soon found this man in the temple and was pleasantly surprised that it was the Lord himself who had come in guise of the stranger. The Lord gave him darshan with the marakkal (measuring bowl) in His right hand and an ezhuthani and olai (pen and palm leaf used as writing pad) in His left hand. Lord is resting in this form after looking into the needs of His devotees, it is said. Divine cow Kamadenu is at the feet of the Lord. Lord Shiva once plucked one of he heads of Lord Brahmma which simply stuck to His hands. He could not separate it from His hand. Hence, Lord Shiva asked Agni to burn the head. Agni-Fire too failed. Also Lord Shiva incurred the Brahmmahati dosha. Lord Shiva had the curse removed by worshipping Perumal here. Lord Shiva has His due place in the sanctum near Perumal. Sage Brugu and Tirumangai Azhwar are also in the sanctum. According to our belief and scriptures, there are two pillars in the Paramapata, Abode of Lord Vishnu. Jeevas would be relieved of their sins if they embrace these pillars while going up. There are two such pillars in this temple in the Arthamandapa. Devotees use to circumambulate the pillars in even numbers and worship the feet and head of Lord to attain salvation. Those awaiting marriage also worship this way for realizing their wish. Of the 108 Divya Deasas, only Srirangam and Adanur temples only have these pillars. When Sage Brugu worshipped Perumal in the Milk Ocean, Mother Mahalakshmi presented the sage with a garland. The sage gave it to Indira who in turn placed it on the head of his elephant. The animal drew the garland and crushed it under its foot. Boiling in anger, the sage cursed Indira to be born a human on earth. Indira fell down to earth and rushed to Lord seeking relief. Mother Mahalakshmi assured Indira that she would be born the daughter of Sage Bruhu and he would be relieved of the curse when She weds Perumal then. Indira waited for the time. When the divine wedding took place, he got the relief. Lord Perumal granted darshan to him in His celebrated reclining posture. It is believed that worshipping Perumal in the temple would bring in prosperity in the family and bless the devotee with excellence in educational pursuits. Devotees offer vastras and special nivedhanas to Perumal. Thiru Adhanur is just about a kilometer from another Divya Desam, Thirupullaboothangudi. It is 11 kms from Kumbakonam and 5.5 Kms from Swami Malai. There are buses that ply every half an hour from Swami Malai and Kumbakonam to Thiru Adhanur. The temple is open from 7.00 a.m. to 12.30 p.m. and from 4.00 p.m. to 8.00 p.m. Via Pullam Boothankudi, Papanasam taluk - 612 301. Temple Priest: Sri. Seshadri Bhattachariar.